The Delta Hydronics Aquarium Boiler Package is a compact, energy efficient, and cost effective way to provide temperature control to a single point application in Zoos, aquariums, pools, etc. 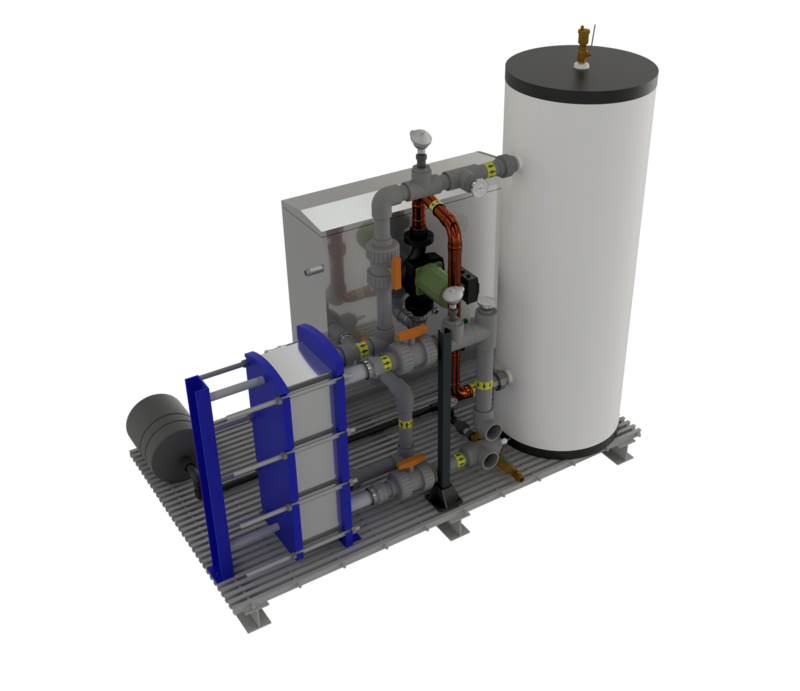 The package utilizes a 95% efficient Condensing Boiler, Insulated & Jacketed Buffer Tank, and Compact Plate Heat Exchanger (Titanium or Stainless Steel) in a closed loop hydronic system to effectively bring your application to a desired temperature setpoint. All equipment comes pre-plumbed, mounted on FRP grating secured with 316 SS hardware. DH-ABP-110 110 000 15-25 GPM 60" x 36" x 52" 30 GALLON 1.5"
DH-ABP-155 155 000 15-25 GPM 60" x 36" x 52" 30 GALLON 1.5"
DH-ABP-200 200 000 20-30 GPM 60" x 36" x 52" 30 GALLON 1.5"
DH-ABP-285 285 000 20-30 GPM 60" x 36" x 52" 30 GALLON 1.5"
DH-ABP-400 400 000 55-70 GPM 84" x 48" x 82" 50 GALLON 2"
DH-ABP-500 500 000 65-80 GPM 84" x 48" x 82" 50 GALLON 2"
DH-ABP-600 600 000 80-95 GPM 84" x 48" x 82" 80 GALLON 2.5"
DH-ABP-700 700 000 95-110 GPM 84" x 48" x 82" 80 GALLON 2.5"
DH-ABP-800 800 000 105-120 GPM 84" x 48" x 82" 80 GALLON 2.5"